Packs a punch well above its weight. Following on from my Ibanez RG465M mini-review, here is my Blackstar HT-1R combo review. The Blackstar HT-1R is the newest edition to the HT line of Blackstar amplifiers. This tiny little brother to the Blackstar HT-5 is a 1watt 2 channel valve amplifier, sporting 1xECC83 and 1xECC82 valves, digital reverb, and an 8″ speaker. The control set is slimmed down from the HT-5, and only has a gain, volume, ISF control for tone, and the aforementioned reverb. It is also equipped with the speaker emulated output and headphone jack, and sports an MP3/line in. This slimmed down control set sounds like it could be fairly limited when it comes to dialing in a tone, but that couldn’t be further from the truth. It seems that the Blackstar crew have really taken the time to dial in the perfect tone into the HT-1, which allows the ISF control to offer a wide range of tonal options to suit most people. I found that by setting the ISF control in the same 3 o’clock position that I set on my HT-5 to, that I had pretty much the same sort of tone I got with my HT-5, even with my personal 3 band eq settings. An 8″ speaker is always going to compromise your tone and volume in some way. The HT-1 did sound a little boxy, but as long as you are not cranking the volume it’s perfect for a practice amp. The clean channel is quite nice, but breaks up very early. I’d imagine that playing the HT-1 through a 12″ or set of 12″ speakers would result in far more clean headroom, but once again for a practice amp it’s up to the task. The cleans can be nice and chimy, or have a bit more grunt if that’s your cup of ale. Just spin the ISF control around and you’ll find some really nice clean tones to suit your tastes. Just like I found with my HT-5 the HT-1’s dirty channel is just simply awesome. It goes anywhere from classic rock crunch through to a nice metal drive. It’s not capable of extreme buzz-saw gain, but throw an overdrive pedal in front of it and I’m sure it will return with the goods. I was playing the Ibanez RG465M, which sports a DiMarzio D-Activator and Air Norton S combo, and this guitar was able to absolutely scream through the HT-1. The amazing thing with the HT-1R is that even with a single 8″ speaker the amplifier sounds so much better than it has any right to. It really punches above it’s class when it comes to tone, and I can imagine that it would only sound even better with a “proper” speaker cabinet setup. The reverb, while not really my thing is a nice pleasant sounding reverb effect, and sounded pretty nice both with a subtle setting, and with it cranked right up. I think most players who like some reverb in their tone would be more than happy with it. If you are looking at the HT-1R as a studio recording tool it should be perfect for you. With the speaker emulated output gives you the power to record with no external sound, and the 1×12 and 4×12 virtual cabinet options sound almost as good as the real thing mic-ed up with a quality microphone. It would be nice if the HT-1R came with an effects loop, but at such a low price point it’s probably not possible to have an effects loop, and keep the price so low. The build quality of the HT-1 is as you would expect from any of the Blackstar HT line of amps. Everything feels nice and solid, and the quality of the materials used is up there with amplifiers that are far more expensive. 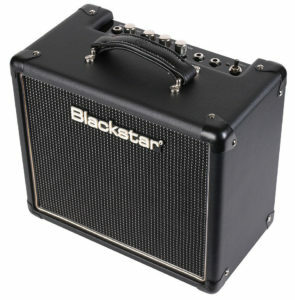 Overall the Blackstar HT-1R is an amazing amplifier for the little money required to buy one. I would recommend to anyone looking for a small practice amp, or small studio recording tool to check it out. I’d even recommend people starting out on guitar to spend a little more on a practice amp and get a HT-1. The tone and quality of this amplifier is far beyond what anyone would expect from something of it’s size. It will probably hold a far better resale than the usual Peavey, Roland, and Squire, etc type practice amps that most get when they get their first electric guitar. 8 Responses to "Blackstar HT-1R combo – review"
Nice review bro!Any ideas how to mod it?Did u mess with lamps? I wonder if it’s possible / easy to mod HT-1 to have a footswitch (should be easy?) or maybe even an effects loop? The lack of EQ is not a big deal, and the other two differences with HT-5 look fixable. Hey Tim, yes I’m sure it should be possible for a competent tech to add an effects loop. Not sure about the foot switch, but I’m sure it could be done too. I wouldn’t worry about the lack of EQ anyway, Blackstar have done a great job of voicing the ISF knob so it always sounds great no matter where you set it. The HT-1 users would be very happy to see your instructions! Meanwhile, if I get to try to make a footswitch mod I’ll send you a link to a blog post. btw, what is the volume difference between HT-1 and HT-5? I’m especially interested in minimal hi-gain volume, I’ve heard the volume knob is way too sensitive on HT-5. There was a reasonable difference in volume, but the HT-1 is still more than capable of being loud. Both the HT-1 and HT-5 sound great at low volumes. I haven’t really had issues with the volume knob on my HT-5. It operates much the same as any other amp I have played. It is fairly sensitive at low settings, but like I said, not really any different to any other amp I’ve played.